With Topps releasing one of its most anticipated products of the year, 2012 Topps Heritage, next week, I thought it would be a good time to look at what to expect and why I'm stoked. I will be busting at least 32 cases next week and am very excited about the possibilities. Browse brentandbecca's selection of 2012 Topps Heritage Baseball Cards. Topps Heritage is unlike any other release for me. It has some of the most loyal, dedicated collectors I deal with each year. Ironically, it does not offer much excitement when opening it. Many case breakers call Topps Heritage one of the more boring breaks out there. But that does not mean it is not a great product. In fact, it is an exceptional one. Today, with so many releases focused on the hit cards in a box, Topps Heritage offers just one per box. And usually they are single-swatch jersey cards. Perhaps one or two boxes per case will have an autograph or other special card like a 1963 Mint Card or a Flashback Stadium Seat relic. Plus, when you a pull an autograph, it's most likely a player from the year being redone, in this case 1963, so you may not have even heard of the guy. However, there is tremendous value in the other cards. The base set is highly collectible. Throw in the 75 short prints that are found 1:3 packs, and that makes for a $300+ set for cards 1-500. Then there are the traditional insert cards of New Age Performers, Then & Now, Baseball Flashbacks, and News Flashbacks. Finally, the traditional Chrome parallels, Refractors, and Black Refractors round out the set. Topps Heritage always offers some unique, but often familiar, errors and variations that mimic the original set or add new twists. Last year, we saw the green tint cards, while retail brought on blue and red tints. The Babe Ruth Story cards were also included, as well as some rare variations of Alex Rodriguez, David Wright, and Joba Chamberlain that appealed to the 1962 set. What does Topps have in store for us this year? We will all begin to learn these mysteries in the coming weeks ahead, and it should be a very fun ride! Aside from the traditional sets, inserts, and parallels, Topps will bring back Clubhouse Collection game-used cards, including autographed and dual-relic versions. Also, the always popular on-card Real One Autographs are back. Red ink versions are numbered to 63 copies. Even more rare are Clubhouse Collection Relic Autographs, Flashback Autographs and Cut Signatures. Topps also has the traditional stadium seat relics in the Flashback Relic set. 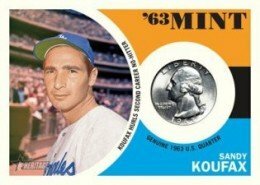 New last year were 1962 Mint cards that depicted popular players with a 1962 coin, ranging from a penny to a half-dollar. Topps is bringing this set back and have added a special JFK Story version with a half-dollar numbered to 48. These cards did well last year and I am sure collectors will enjoy them once again. Finally, Topps has included its traditional box toppers of Advertising Panels and buyback cards from the 1963 set that have a special Buyback Stamp on them. I am always excited to see what errors and variations Topps includes. The 1963 Topps Baseball set is full of such cards that range from the wrong player on the card front to the various errors on card backs. Some cards also have two versions of photo cropping. The Topps Heritage variations are not only very tough to pull, but even tougher to spot. You can check out ebay for some of the errors and variations to see what Topps might have in store. The 1963 Topps Baseball set also had different versions of checklists and the 'floating heads' quad rookie cards. Early indications point to many variations of the 'floating heads' cards, but it seems that they will be quite common. Topps has also announced plans for variation cards of the JFK Story. These will be similar to the Jackie Robinson Story cards from last year and should be fun to keep an eye out for. Topps has also introduced a new insert by bringing back a familiar set from 1963. Stick-Ons will be found just three per box, so the 46-sticker set will be tough to complete. This set is based on the 1963 Topps Peel Offs. I think it is quite funny that the names of the sets are opposites of one another and am looking forward to the new insert. Topps has also repurchased some original 1963 Peel Offs and will frame them and place 100 of them into random packs. I am sure there will be plenty of other surprises this year. And while I do look forward to all that Topps Heritage offers, I mostly enjoy it because of the history it brings. I love mixing the old in with the new. I appreciate the card designs and the stock they are produced on. I appreciate the attention to detail with Topps matching much of what the 1963 set was like. Adding new twists and variations make the set more modern. In a day where cards seem to be more about hits or money, Topps Heritage also makes it about history and the cards themselves. Topps continues to make Heritage in a way that collectors can appreciate and understand, while still making it collectible year after year. Since I was not around until 1978, it is a way for me to learn the older sets better and some of the players. I collect Heritage sets and autographs more than any other set. I understand why some may say it is a bit boring, but there is more to this set then just hit after hit or something new. I hope Topps never changes it. I would love to see the 50th anniversary set done each year just like they have done. I'd also be up for 25th anniversary set as well. 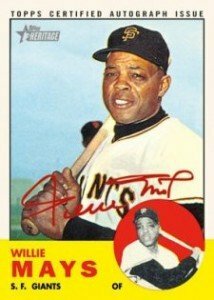 And while it may be costly I would love to see Topps begin producing future Real One Autograph cards now and collect on-card autographs from those living that played in the 60s, 70s, 80s, 90s, so that one day, no matter what may come, we would be able to get our favorite players on an on-card Heritage Real One Autograph. I know I may be dreaming a bit. Check back later next week as I begin opening and sharing the excitement of 2012 Topps Heritage Baseball. Great summary. I share your admiration for the Heritage release! The card stock is fantastic, a bit thicker than most other issues – I don’t know how to put it into words; it just feels right. The non-glossy finish is also a “plus” in my book. This feature makes the Heritage cards perfect for autograph requests without a fear for smudging. Gypsy Queen offers that same attribute. Most of all, I enjoy the attention to detail that Topps pours into the backs of Heritage. The facts, snippets and cartoons from the ’11 set are really well done and supply a lot of great information that can keep a collector busy for quite some time – as long as that collector has the patience to read the cards backs! Which is poetic and appropriate because I think a little more of that occurred back when the orginal sets were released! I had to prioritize my box-buying this year and when it came to hobby box splurges, Gypsy Queen barely edged out Heritage. However, I enjoy the set so much that I quickly reserved one of your base sets via pre-sell. Easily justifiable at less than the cost of a box. I’m looking forward to enjoying every card! Great summary! I can’t wait for this to come out!